These Candy Crush Jelly Level 69 cheats and tips will help you beat Jelly Level 69 of Candy Crush. The objective of Candy Crush Jelly Level 69 is to find 5 pufflers within 35 or fewer moves. Candy Crush Jelly Level 69 is a simple level that requires you to break the frosting and find five pufflers in 35 or less. The level’s design leaves the player with limited space to begin play. Therefore, you must begin by creating more space to allow for better moves on the playing field. 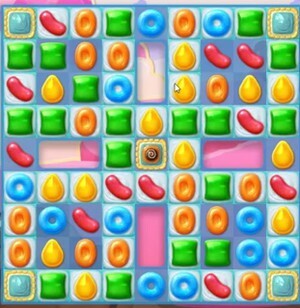 Starting with the five-layered pie at the center of the board is the only way to start creating more space to play in for Candy Crush Jelly Level 69. You can begin by matching candies adjacent to this blocker, and each will be removing a layer of this pie. The effect of special candy if you can manage to form one will also have a significant effect on the pie in Candy Crush Level 69. With the pie gone, it will be easier to beat Candy Crush Jelly Level 69.